Welcome to the first annual J-Up Awards! During this year’s ceremony we will be celebrating some of Josh’s favorite comics of 2018. So, let’s crack some envelopes and get to it! Ahoy Comics entered the world this year and comics is all the richer for it. The publisher’s slogan “Expect More” is exemplified in their comic book magazine format. Their titles (which include High Heaven, Wrong Earth, Captain Ginger, and the sleeper hit Edgar Allen Poe’s Snifter of Terror) feature not only ongoing comic stories, but the books themselves feature material like creative prose short stories, essays, and back-up comics in each and every issue. Now, all of that wouldn’t mean anything if the stories weren’t good. But here’s the thing, so much of what they have put out is great! Wrong Earth has been telling an excellent story wherein a Batman 66 style superhero finds himself in a grim-dark 90’s universe (and vice versa) with amazing art from Jamal Igle. Grant Morrison’s back-up prose stories have been great throughout the line’s launch. High Heaven, which focuses on a man named David Weathers who is in heaven…but hates it, is equal parts hilarious and sad. Captain Ginger features cats in space! And…well, we sold out of Edgar Allen Poe’s Snifter of Terror so quickly that I haven’t had a chance to read it yet, but I hear its great. I hope Ahoy keeps the momentum in 2019 and that more publishers aim to cram as much creativity and energy into their books as Ahoy has managed to do in 2018. They set the bar high. In this newest iteration of the Hulk, Ewing cleverly revisits the original dynamic between Bruce Banner and his angrier side: night time is the Hulk’s time. That’s right, rather than the Hulk coming out whenever Banner gets angry, the Hulk comes out at night. Oh, and the Hulk cannot die (though Banner can). Oh…and if this sounds like a premise for a horror movie, that is because this series has reinvigorated the Hulk concept by introducing aspects of the horror genre to his story. I cannot say enough about this book, Al Ewing is Marvel’s most underrated writer and the work he is doing with Bennett by his side is incredible. Okay, so I am a mark for anything Grant Morrison, but this book really caught me off guard with just how much I am loving it. This book was pitched as being, essentially, Hal Jordan: Space Cop, and it delivers on that front. We get to see some inner workings of the Corps with trappings of a police procedural. At the same time this is still an extremely weird and fun superhero book. Liam Sharp’s art is incredibly detailed and fully immerses you in the alien locales the book visits. The alien designs are wild…we’re talking creatures whose heads are erupting volcanoes, we’re talking a Green Lantern who is a sentient flu, and so much more that you need to see. His style almost makes this feel like a 2001 AD story but with enough visual connective tissue to ground it in the DCU. I find it to be a unique and rewarding aesthetic. Morrison’s scripts have been filled with humor, adventure, and a sinister plot that I cannot wait to see more of in 2019. If you want to get weird with the GL Corps, look no further. Best Dairy Based Crossover: Milk Wars by a murderer’s row of creators. This Young Animal/DCU crossover felt like it was custom made for me. Doom Patrol team up with members of the JLA to take down a Superman analog known as Milkman Man who was born of nothing and now threatens the multiverse due to his employment by an evil corporation who are looking to homogenize the multiverse? Yeah. SIGN.ME.UP. But wait, there’s more! All of the Young Animal books get a chance to crossover. 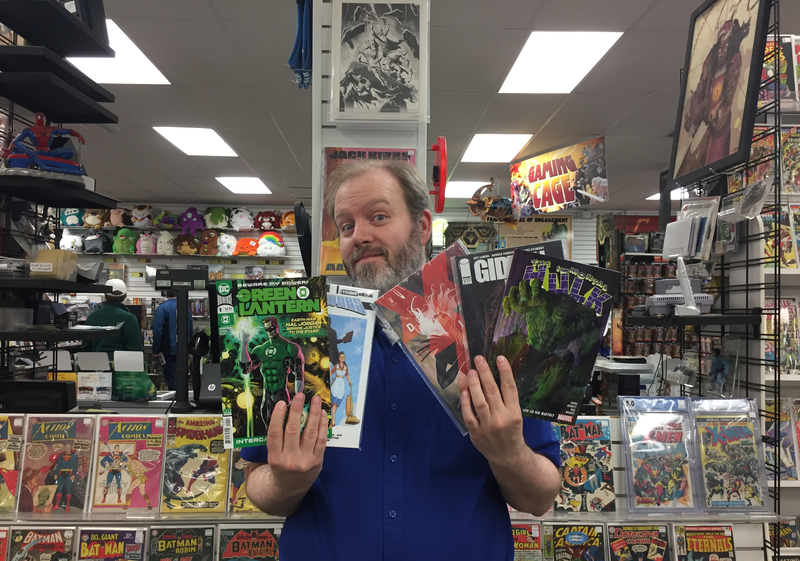 We’re talking Cave Carson teaming up with Swamp Thing to battle evil Funko Pops, Shade the Changing Girl vs. a twisted version of Wonder Woman, and Mother Panic vs. Father Bruce Banner in a fight to free the citizens of Gotham City. Oh, and Frank Quitely did the covers. So. So. Good. This event was bizarre, fun, and creative in the way that only comics can be and that is why I love it so much. The event stands on its own, but if you are a Doom Patrol fan, I would suggest reading all of Vol. 1 and 2 before you dig in as there are some slight spoilers for that series in the pages of Milk Wars. That said, more comics events should be this ambitious and fun in my opinion. Jeff Lemire is one of the best writers currently working in contemporary comics. So, when he announced that his project Gideon Falls was a “character-based meditation on obsession, mental-illness, and faith” inspired by works such as David Lynch’s Twin Peaks, I was already sold on checking out the book. What he and Andrea Sorrentino have delivered is even better than I could have imagined. The story focuses on two main protagonists: Father Wilfred and Norton. Father Wilfred is a priest who has arrived in the rural town of Gideon Falls to take over their local parish, though his faith may be waning. Norton is a man living in a city who suffers from some undefined mental illness. Their lives are connected, in ways we are still discovering, by The Black Barn, a mysterious building whose appearance leaves in its wake terror, madness, and confusion. As always, Lemire’s character work here is phenomenal. The emotions of all the characters are realistic and their doubts, motivations, and confusion aren’t merely understandable in a clinical sort of way, but felt by the reader as well. Sorrentino’s storytelling and art in this series is masterful. Conversations and quieter moments are given weight by his choice of character focus. To illustrate the effects of The Black Barn, Sorrentino employs layouts that twist the reader’s perspective in an effect mirroring the twisted perspective of the story’s characters. This book is a master class on visual storytelling. I love Kieron Gillen. His knack for examining and deconstructing the pop culture he loves has drawn me in since he and Jamie McKelvie first brought out Phonogram. His most recent book, Die, explores another one of his obsessions, role-playing games. The first issue was excellent and it has me passionately excited to see where this story goes in 2019. Imagine the old Dungeons and Dragons cartoon: a bunch of kids disappear into the world of D&D and become the characters they played. They have adventures and probably return to the real world unscathed. Well…what if they didn’t? What if, instead, some horrible things changed while they were in that world. What if they leave scarred, emotionally and ,in some cases, physically? What would that do to a person? What would that do to a person decades later when they are forced to look back at that world and their actions? Welcome to Die. Stephanie Hans is the artist on this book and she delivers a world that is just as lush and simultaneously drab as you hope for from a book that has famously been pitched as “Goth Jumanji.” Right now there is only 1 issue of this book out, but as they rediscover this fantasy world I cannot wait to see Hans’ imagination on the page. What really draws me to this book is in part the promissory note that Gillen has given us in both the backmatter of issue #1 and in interviews surrounding its release. He has promised the book will deliver a Planteray-esque examination of the elements that gave birth to the modern conception of fantasy and RPG gaming. Given that Planetary (by Warren Ellis and John Cassaday) is one of my all-time favorite books, due in large part to its examination of genres found in serialized storytelling, this technique as applied to fantasy and RPGS has me very intrigued. At its emotional core, Gillen has noted the book is in part a metaphor for an adult looking back at their teenage fantasies and aspirations and realizing they have fallen short, in part or whole, on realizing those dreams. While potentially depressing, this type of emotional exploration in the medium of comics seems powerful in the hands of Gillen and Hans, and I, for one, am along for the ride. This book…what is there to say that hasn’t been said? King and Gerads really created a masterpiece with this miniseries. While it started in 2017, it was 2018 that saw the resolution of this story that utilized the fantastical world of the New Gods to explore such real world issues as depression, parenthood, and the seemingly eternal work/personal life balance that many of us face. The story finds Mister Miracle thrust into a war between Apokolips and New Genesis in the world of the New Gods. It also finds him trying to figure out how to rearrange his apartment here on Earth. This juxtaposition between the fantastic and mundane is unlike maybe any other story I have seen in comics, and it works to make the emotional beats hit for me as a reader. Gerads use of the nine-panel grid is a nice formalistic nod to the classic Kirby stories that came before, and his art in general is amazing. In lesser hands, the story could have easily become grim and dark to the point of morbidity, but King and Gerads find just the right amount of humor to ease the tension found within the plot. Whether it is Scott Free’s seemingly endless superhero T-shirt collection, or the perfectly pictured moments of companionship we see between Scott and Barda, the dark never quite overshadows all of the light within the story. I know this book has appeared on both Liz and Andrew’s lists, so I don’t feel the need to go on and on about it, but as a fan of the New Gods and a fan of comics aptly tackling real world issues, be they political or, in this case, personal, I really loved this series. Oops. That music means it is time for me to wrap up these awards! Thanks to everyone for coming out this year. You can find your gift bag under your chair.